Bus ridership in New York City fell 16 percent between 2002 and 2015 — a troubling trend that only gained steam last year. A look at the changes in each borough by transportation analyst Eric Goldwyn shows that since 2007, the bus ridership decline has been concentrated in Manhattan and Brooklyn. But one factor is almost certainly traffic congestion. Average vehicle speeds in Manhattan below 60th Street declined 12 percent from 2010 to 2015, according to DOT. Without an effective traffic reduction plan from Mayor de Blasio or action from Governor Cuomo to enact toll reform, the traffic that makes buses so slow and unreliable may only get worse. Of course, while the center city may have the worst traffic, bus service all over the five boroughs gets slowed down on congested streets, as you can see in this map of p.m. bus speeds from DOT’s recent Mobility Report [PDF]. 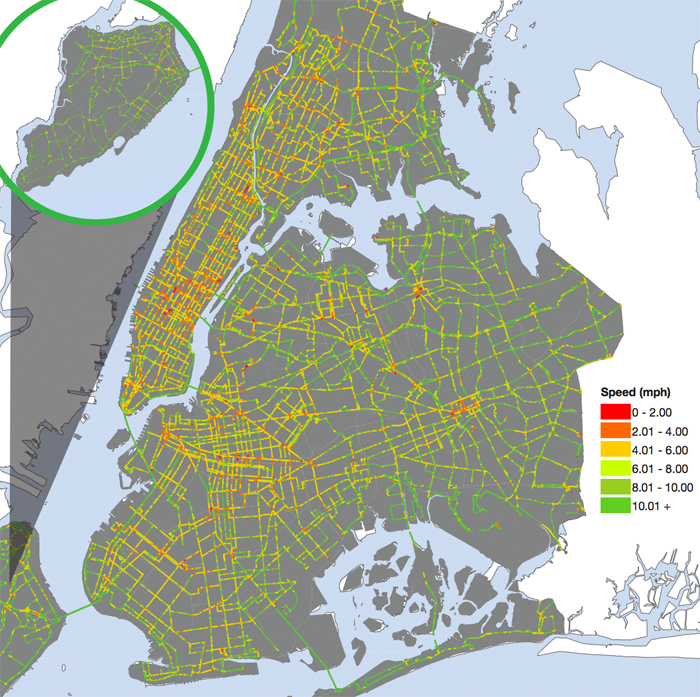 Systemwide strategies to help buses beat traffic can reverse the decline in Manhattan and Brooklyn and grow bus ridership again in the Bronx, Queens, and Staten Island. NYC MTA should consider letting bus riders be able to board and pay at all doors on bus to help expedite service. I’ll go with demographic change as the top cause. Between rising congestion and service cuts, bus service is worse than it once was. But it wasn’t that good to begin with. The subway was already a better deal for those who neither feared the subway nor were unable to make the stairs. Moreover, it isn’t just the bus getting worse. It’s the subway getting better until two years ago, and biking getting better. Basically, bus ridership fell in the boroughs with the most bicyclists, and the largest share of the population within walking distance of the subway. I bet most (suburban, mostly white) newcomers never really orient themselves to buses. They move to the parts of Brooklyn and Manhattan they move to because the subway or/and an otherwise completely pedestrian lifestyle appeals to them. Then there’s the phenomenon of job attrition. Many bus riders to remoter parts of the city may keep their jobs until they retire or don’t want them anymore, and then aren’t replaced. And with bus attrition, people who replace someone leaving a job will be less likely to come by bus. Wait a sec, the 2016 decline in bus ridership looks to be MUCH more pronounced on the weekends than weekdays, right? Average weekday NYCT local bus is down 1.6% over 2015, but average weekend is down 4.2%? MTABC local buses actually UP 0.5% on weekdays but down 1.2% on weekends? We know that the recent subway ridership decline is due to weekends alone. Weekday ridership actually notched up a bit on the subway. Weekend service is bad, so people have chose other ways to get around, or forgo travel at all. It looks like we have the same issue with buses. Weekend bus service is awful, and the idea that it’s largely due to overall traffic congestion is totally unconvincing to me. People have more options than they used to: those living in the yellow cab desert now have green cabs, Ubers, CitiBikes, and yes, they’re younger and more able-bodied people who can walk and ride their own bikes distances where their forebears would have taken the bus. I’m not convinced that tolling the East River Bridges and 60th Street (something I’m not against in general) would improve the MTA’s awful weekend bus service. People who can afford it would rather call an Uber than wait 30 minutes for the next bus to show up. And now that they have MTA Bus Time app they can see confirmation that there are “no buses on route” or that the next bus is “5 miles away (plus layover at terminal).” I don’t blame people for seeking to not be captive audiences for poor transit. I don’t understand people willing to drive on Queens Blvd during rush hour and even mid-day it can be pretty bad. I once decided to take a Q32 into Manhattan instead of the 7 from Woodside to see how it is. So many trains actually went ahead of my bus that I couldn’t believe the amount of able bodied people that apparently take it to transfer at Queens Plaza which is mind boggling in of itself given the 7 can give those transfer options. Here’s the fun part, I got off there and took the M to get to Mid-Manhattan library. When I was done borrowing books, I needed to get to Penn Station next, so I opted for a Q32 or one of the M’s that go there as well, and the exact same Q32 bus showed up. The driver was like “wtf!”. Bustime has probably helped off peak. But the buses are just too slow. Let’s say you are at a show here. You have the Uber and Lyft app and the phone number of a car service, and some outer borough taxis in the area. And the B61 bus nearby. Which to you choose, if you are an early to bed, early to rise person? I’ve done it both ways, and driven our own car there. It’s 20 minute headways on a Saturday night, and a 35-plus minute ride. I think it’s a combination of demographic change plus a changing economy. Buses used to get more ridership due to a combination of people too afraid to ride the subways, plus people who just couldn’t physically take the stairs. The former group largely doesn’t exist anymore, or if it does by now those people whose attitudes towards the subway never changed are in their 60s or 70s. They just don’t need to travel as much as before. The latter group is probably declining as well given that we’ve made at least some stations handicapped accessible. Of course, a third group is those in areas with no competing subway service. That’s a large part of Queens and most of Staten Island. No surprise these numbers haven’t shrunk. The buses basically have a captive audience. As for why they haven’t grown with the population, I think it’s a combination of the renaissance of cycling plus e-commerce. I live in eastern Queens where bus service to get around locally is at best marginal. If I had to make local trips I usually just walked. Sad to say, once you count waiting time, walking often isn’t significantly slower than taking the bus, even on trips of 2 or 3 miles. Or at least it’s not faster by enough of a margin to merit paying a fare. Granted, not everyone can or wants to walk, so these buses do have a steady ridership despite their shortcomings. However, many of the younger crowd are not adding to the ridership. Instead, they realize biking is a better alternative. It was and is for me as well, provided I have safe bike parking. And then there’s e-commerce. Back when I had no choice but to go to a brick-and-mortar store, I had three possibilities-bus, bike, or walking. I rarely choose bus for the reasons I mentioned. I chose bike about half the time but generally walked if the trip was less than maybe 2 miles. Nowadays my fourth option is Amazon or eBay. That’s the one I usually use. I think it’s also the reason bus ridership hasn’t grown in Queens or the Bronx or Staten Island. Why take an inconvenient bus ride, wait on a line to pay, carry what might be something heavy home, when you can buy it with a few mouse clicks? E-commerce is also something which may well redefine how cities work. Ground floor retail used to be sufficient if you want street life. Now we might have to consider that it’s not enough. People will still physically go to stores for groceries, but many other types of brick-and-mortar stores are heading for extinction. How to create street life in such an environment is an interesting question. We’ll have to give people other reasons besides just buying stuff to leave their homes. I don’t get why anyone would take a bus on Queens Blvd myself. Forest Hills to Queens Plaza is 12 to 14 minutes on the express. It’s about 20 minutes on the local. Bus probably takes at least 40 minutes although I’ve never tried it. Headways are a big reason I personally don’t ride the bus. I’ll occasionally find a route that might make sense to take over walking to a subway, but when I check Google Maps, I’ll find that the next bus might not be for 15 minutes. At that point, I’d be better off walking. One word that has freed me from the dreaded B61, Citibike. Not only have I cut ten minutes off of my commute (based upon getting on the bus and getting on the bike at the same time), I now control my own destiny as I am no longer waiting for a bus. I’ve lived in Brooklyn for 50 years and I can’t remember the last time I took a bus. I kniwcthatvitcwas crowded and slow and I got off and gave up. I’d rather take the subway and walk. If I need to go to a place not covered by the train, I drive, albeit very rarely. Seems to me that Bus Time would improve ridership by letting people manage their time better. That said, at those times, the bus is even worse. Agreed. Google Maps thinks it’s a short ride, but there’s almost always “train traffic ahead” that brings the time to 20-25 for express service. MTA is a business that continuously LOSES money that tax payers fund…..Maybe you s hound check into this and get back to us. Less is more to these urban planners.